When Batman squares off against Superman in this weekend's release of "Batman v Superman: Dawn of Justice," alert moviegoers may spot a real-life politician in a key scene. "It's a dark movie," observed Sen. Patrick Leahy, D-Vermont. Leahy, the longest-serving member of the U.S. Senate, has a cameo as a lawmaker in the blockbuster film. In a key scene, Leahy's "Senator Purrington" takes part in a hearing on whether Superman is a friend or a foe to the nation. "We've never had Superman as a witness," Leahy joked, referring to the countless U.S. Senate hearings he has taken part in over his long career. "And we've never had quite as much excitement as you're going to see in this hearing [in the movie]." 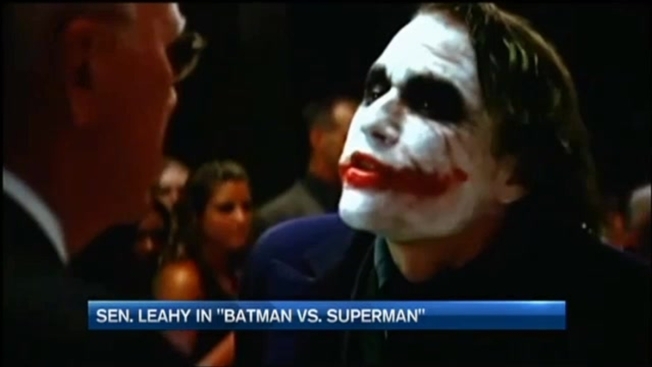 Leahy is a longtime Batman fan, who has had cameos in other productions starring the Caped Crusader. In tiny roles, he has voiced animated characters, stood up to the notorious Joker, and sat on the board of Gotham City's Wayne Enterprises. The friendly relationship between the senator and the creative minds behind several Batman films started many years ago, when Leahy caught a minor error in a Batman publication and reached out to contacts in the comic book world to report it. For these brief on-screen appearances, Leahy doesn't exactly score Ben Affleck-level paydays, but he does earn residual payments from Hollywood, which he donates to the children's wing of the Kellogg-Hubbard Library in downtown Montpelier. "He's our superhero," said Tom McKone, the executive director of the Kellogg-Hubbard Library. "It's a huge help to us." McKone said those residuals have added up to more than $20,000 over the years, on top of big hauls from movie-related fundraisers Leahy's hosted. The money boosts daily operations and funds programming for kids, McKone explained. "Nothing encourages me more than seeing kids reading," Leahy told necn. As for future movie roles? Leahy couldn't say, hinting there's a question if his fictional Sen. Purrington even survives the clash of comic book giants in "Batman v Superman: Dawn of Justice." "We'll have to see," Leahy said, smiling. Asked by necn in 2012 if he'd give up his day job for acting, Leahy chuckled, "No, and I'm not giving up D.C. for D.C. Comics, either!"